1. Yama (The five "abstentions"): Non-violence, non-lying, non-covetousness, non-obsession with sense data, and non-possessiveness. 2. Niyama (The five "observances"): Purity, contentment, austerity, study, and surrender to a higher power. 3. Asana: The physical practice most of us understand to be yoga. 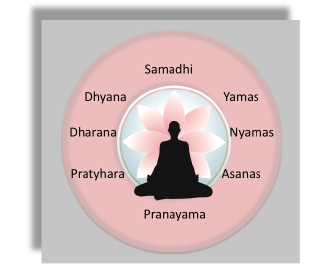 Asana literally means "seat", and in Patanjali's Sutras refers to the seated position used for meditation. 4. Pranayama ("Suspending Breath"): Prâna, breath, âyâma, to restrain or stop. Also interpreted as control of the life force. 5. Pratyahara ("Abstraction"): Withdrawal of the sense organs from external objects. 6. Dharana ("Concentration"): Fixing the attention on a single object. 7. Dhyana ("Meditation"): Intense contemplation of the nature of the object of meditation. 8. Samâdhi ("Liberation"): Merging consciousness with the object of meditation.